Old Testament - We read a great parable from the prophet Nathan today to start the chapter! Wow. Convicting stuff for David... You'll note that David said in response to this parable in verse 6: "He must pay for that lamb four times over, because he did such a thing and had no pity." Well, sure enough, David paid for the death of Uriah 4 times over through the future deaths of 4 of David's sons: the unnamed son who dies in this chapter, Amon dies in chapter 13, Absalom in chapter 18, and Adonijah in First Kings 2:25. I read a commentary that said God forgave David of his sin, but God did not negate all the consequences of David's sin. 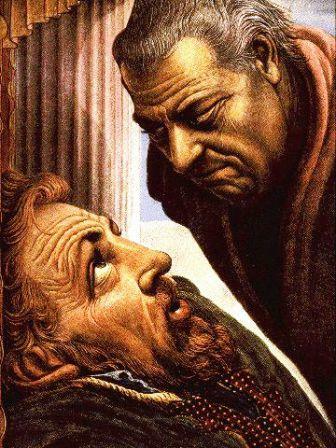 Below is a portrait by Guy Rowe of David being confronted by Nathan. You can imagine Nathan saying verse 9 in this image: "Why did you despise the word of the LORD by doing what is evil in his eyes? You struck down Uriah the Hittite with the sword and took his wife to be your own. You killed him with the sword of the Ammonites." Bible.org's commentary on our Second Samuel readings today titled "David and God (Nathan)" is at this link and "Real Repentance" is at this link and "The Death of David's Son" is at this link. 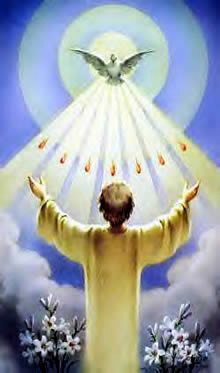 Bible.org's commentary on our John readings today titled "The Ministry of the Holy Spirit" is at this link. Proverbs - Proverbs chapter 16 verse 5 today teaches us: "The LORD despises pride; be assured that the proud will be punished." This Proverb reminds me of a talk I recently heard by Jim Collins, author of Good to Great. 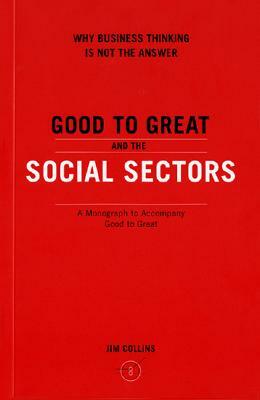 I am a huge fan of Jim Collins work and had the good fortune to hear him talk about his recent monograph titled "Good to Great and the Social Sectors", which I HIGHLY recommend to anyone who works in full time ministry or for a nonprofit - or even anyone who volunteers for either. It's only 42 pages long, but packed with incredible incredible insights. (secular business insights - but great stuff) Anyhow, Jim Collins wrapped up his talk with something that reminded me of this Proverb. He said something along the lines of, "As we go about our work and move our nonprofits/ministries from good to great, let us never fall into the trap of thinking that we've arrived. Let us not fall into the trap of ever thinking that we are great." 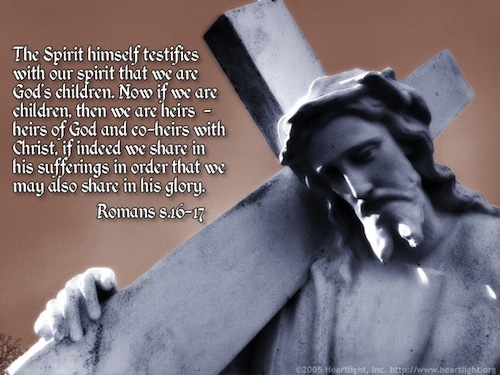 Worship God: Today's readings in John about the ministry of the Holy Spirit reminded me of Abandon's song "Feel it in your Heart:"
Do you feel the Spirit in your heart? Click here and receive the Spirit! Prayer Point: Pray for peace in your life. Pray for more of Jesus in your life. 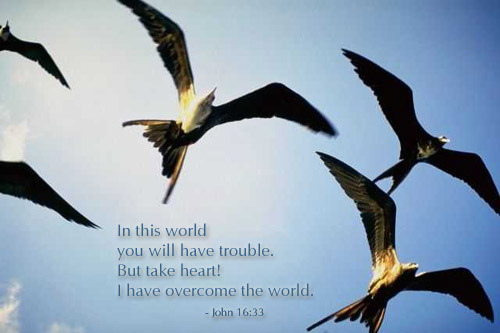 Pray that when trouble comes to you in this world - and it will come - that you will take heart in knowing that Jesus overcame the world. Comments from You & Questions of the Day: Have you ever fallen into the trap of thinking you are great? Also, what verses or insights stand out to you in today's readings? Please post up by clicking on the "Comments" link below! I have wandered off my main goal or purpose for reading through the Bible when I began the New Year. My goal is embodied in the New Living Translation of David’s son Solomon’s advice in the Book of Ecclesiastes 7:13, Notice the way God does things; then fall into line. Don't fight the ways of God, for who can straighten out what he has made crooked? It is exciting to read about David and his victories, it is comforting to know that it is not so much the external behavior but the thoughts and intents of the heart that determine our relationship and thus our fellowship with God. But I should return, repent and go back to my first intent. Finding out how God does things and fall into line. I am an application person; I’m always looking to see how to apply a discovered biblical principal to my life. How do I incorporate that principal that pattern into my life so that it becomes the very fiber of my being. But lately I find myself trying to pattern myself, modeling my behavior after these great people of faith that I have been reading about and noting those people who have failed miserably, like Saul and Eli. Yet today, while walking in the morning I realized that looking at Abraham, Moses, Israel/Jacob, David etc., was the wrong thing to do because each and every one is flawed. PATTERN YOURSELVES after me [follow my example], as I imitate and follow Christ (the Messiah). (1 Corinthians 11:1 AMP). We are only to follow, imitate look toward the great men and women of faith as long as they are following Christ. To do that we must know Christ, we must be familiar, up close and personal, with Him and not standing a far off garnering our information from what others say He is. If we do that then we are just like stalkers trying to force ourselves, our depraved lifestyles, our perverted way of thinking upon Him. We become “namedroppers” tying to give the appearance of instead of being truly what He has created us to be. Come to think of it, the Old Testament gives us a clear picture of man’s failure of 1) redeeming himself, and 2) redeeming others. The Old Testament points out the failure of man to solve the sin problem leading us into the New Covenant redemption plan through Jesus Christ. As famous as King David remains to this day, as wise as his son Solomon was, the Wisdom of Jesus surpasses them all. If I am my sights toward godly men then I am already setting myself up to sin. Sin means to miss the mark, as in archery, in both Hebrew and Greek. If I aim to model flawed men who have fallen short of the bulls eye then I too will set myself up to miss because I have set my mark far away from God’s bulls eye. I am thankful to be reading about David and his failures because it shows me that even the best of godly men and women are no match for the savior Jesus Christ. This revelation stokes my desire to know Him better and more intimately. Oh my word! My sin seems small compared to David! But we can't compartmentalize sin. Easy to do. Well they did that! Or they did this! We need to acknowledge our own sin. God help us!